The electrocardiogram (EKG) is the representation on paper of the electrical activity of the heart. This paper has certain essential characteristics for the correct reading of the EKG. 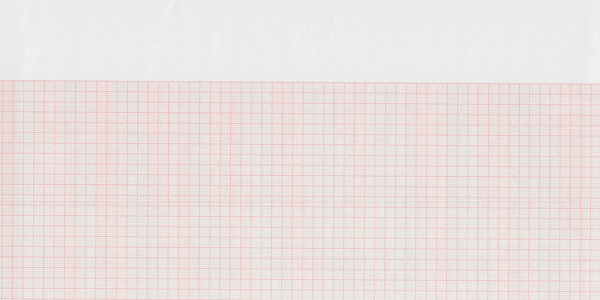 The electrocardiogram paper is a graph paper where for every five small (1 mm) squares you can find a heavier line forming a larger 5 mm square. The vertical axis measures the amplitude of the heart’s electrical current. It is measured in millivolts (mV). By standard, 10 mm in height equals 1 mV. Therefore each 1 mm square on the vertical axis equals 0.1 mV and each large square, 0.5 mV. The horizontal axis measures time. On a standard EKG the paper speed is 25 mm/s. Therefore, each 1 mm square on the horizontal axis equals 0.04 s, and each large square, 0.20 s.
Vertical: 1 mm = 0.1 mV. Horizontal: 1 mm = 0.04 s.
These are the values used on a standard EKG. If needed, we can increase paper speed (to see wave abnormalities) or decrease it (to check for rhythm disorders); we can also increase the amplitude (if low voltage is present) or decrease it (when QRS complexes are too large). At the beginning of the electrocardiogram recording, the electrocardiograph automatically performs a calibration. 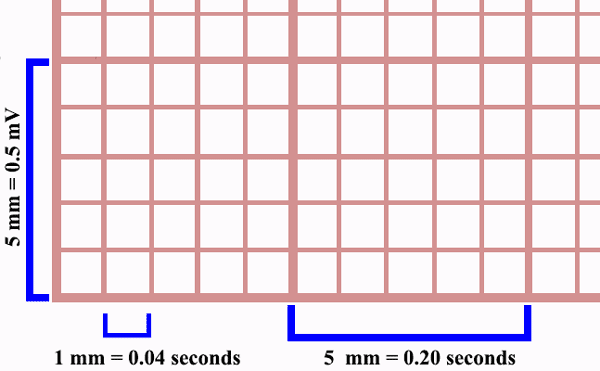 An electrical 1 mV signal is sent for 0.2 s, recording a rectangular shape with a 10 mm height and 5 mm width on the graph paper (see image on the right). This image let us know the calibration used during the recorded EKG. As we previously mentioned, paper speed or amplitude can be adjusted in cases where the QRS voltages are either too high or too low. This would mean a different calibration, and therefore, a change in height or width of the calibration mark. In the next article we will further explain electrodes. Click on next down below to stay with us.